The Trustees of The North Luffenham Village Trust wish to ensure that all in the village are aware of this charity, how it started and what it does. We hope that the following will explain the aims and the management of the charity. The origins of the North Luffenham Village Trust (formerly known as The Town Estate of North Luffenham) can be traced back some 400 years to the reign of Queen Elizabeth 1. The charity was first registered with the Charity Commissioners in 1890. The charity encouraged education and in 1858 funded and built the Victorian school (now a private house) which served the village for 110 years until the present primary school was built in 1969. 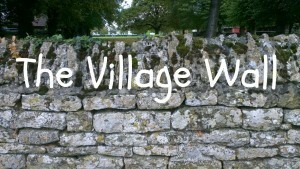 The North Luffenham Village Trust owns property and land which is let to raise income. The net income from these lettings, together with interest from invested monies, is allocated to three areas of benefit as specified by the Charity deed. This area of benefit is relatively straightforward and has remained unchanged since its beginnings. Originally the education grants were given to all village children when they left the village school at the age of between 12 and 14 years for uniforms for the girls, who went into ‘household service’, and to purchase tools for the boys when they started their apprenticeships. 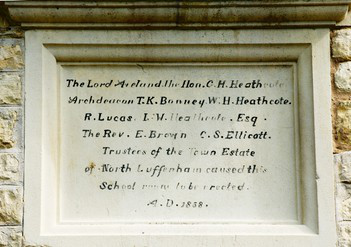 Within the legal ‘Charitable Scheme’ aims for the North Luffenham Village Trust it is now established that the Trust will provide funds for the promotion of education to anyone who is in need of financial assistance. Also the Trust can provide items, services or facilities to the village school. It is the intent of Trustees that the system of delivering support for education should be flexible, efficient and easy for people to use. It should be entirely confidential, non-judgemental and fair. It is the personal responsibility of the Trustees that they, to the best of their knowledge, make grants to people in the village who are in need. It is a priority that all information given to the Trustees remains completely confidential. The Charity Commission (who legally oversee all the grants) insist that the Trust works in partnership with statutory bodies (including the Local Authority) together with national and local charities to ensure that educational support is made available to all in need. The Trust aims to help where State assistance is inapplicable, inadequate or unable to meet need at the time it is required. Although the modern ‘Charitable Scheme’ mentions Education Grants specifically for the under 18 year olds, the Trust will consider any application for Education Grants from the over 18’s under its remit ‘for the general benefit of the people of the village’. All grants will be made in the spirit of a ‘hand-up’ rather than a ‘hand-out’. action when an individual’s circumstances clearly show a need for immediate support. Individuals in need of help may direct their request to The Clerk to the Trustees (name and address on the back page) or be brought to the attention of the Trustees through the Village School, Good Neighbour Scheme or other organisations. Upon receipt of a request for urgent assistance, the Trust will appoint a Trustee who will visit the individual/family concerned and complete a comprehensive report. This report will be private and considered in complete confidence by the Trustees responsible for Education grants. A decision will be made within 48 hours of receipt of the completed report and payment made immediately thereafter. If sufficient funds are available, the Trust will consider making more usual grants for general education needs. The Trust has limited income which may change each year. These grants must be considered as one-off grants and must not be relied on year after year. University graduate degree courses – expenses for books, accommodation, rent, etc. College courses at local university and colleges – expenses, as above, and travel costs. Apprenticeship courses – help with purchase of tools, college books and travel. Secondary school A level courses – daily travel to school. Special educational needs – either ‘gifted and talented’courses or for ‘learning difficulties’ (all applications need to be backed by documentary proof). Music lessons – all applications must show that young people have already passed music grade examinations and have serious aims and devotion to the subject. to the St Mary and St John C.E.V.A. Primary School for extra items not funded by their usual Local Authority income. e.g. Bibles to all Year 6 Leavers, specialist educational equipment. to all Year 6 Leavers who live in the village – a grant for secondary school uniform and sports kit etc. All these applications will be considered in depth by the Trustees on the Education sub-committee. 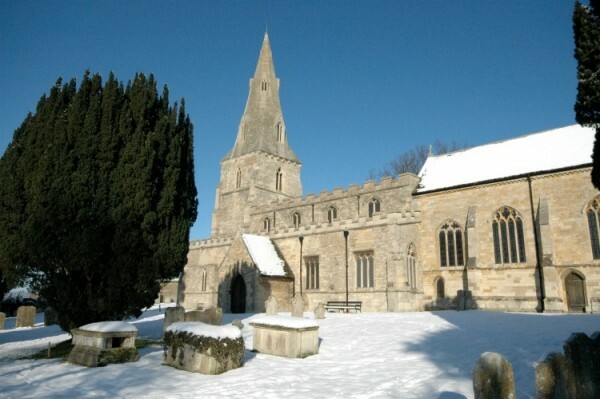 Within the ‘Charitable Scheme’ for the North Luffenham Village Trust it is established that the Trust will provide funds for the relief of persons who are in in need, hardship or distress; and are resident in the area of benefit (The Village of North Luffenham). To achieve this the Trust may provide assistance to individuals in need by making financial grants or by providing or paying for goods, services or facilities directly or indirectly. It is the intent of Trustees that the system of delivering welfare support should be flexible, efficient and easy for people to use. It should be entirely confidential, non-judgemental and fair. The Trust will work in partnership with statutory bodies (including the Local Authority) and national and local charities to ensure that welfare support is made available to all in need. The Trust should aim to bring targeted help where State assistance is inapplicable, inadequate or unable to meet need at the time it is required. maintain the integrity of families and children, encouraging cohesion not fragmentation. those likely to suffer Social exclusion or poverty. the elderly and disabled, to enable them to lead a fulfilling and independent life with dignity. The Trust will operate a grants management system directed to provide swift and decisive action when an individual’s circumstances generate a clearly identified need for immediate support. Requests for an Immediate Welfare Grant should be directed to The Clerk to the Trustees (name and address on back page). Individuals in need of help may be brought to the attention of the Trustees through The Good Companions Club, Good Neighbour Scheme, Village School or other organisations. Upon receipt of a request for assistance, the Trust will appoint a Trustee who will visit the individual or family concerned and complete a comprehensive Welfare Report, which will be considered by a nominated Welfare Committee. A decision will be made within 48 hours of receipt of the completed welfare report and payment made immediately thereafter. The Trust is unable to cover costs relating to legal costs or care home fees. If sufficient funds are available, the Trust will consider making routine grants to help offset heating/lighting costs etc. All applications will be considered by the Welfare Committee. Trustees of The North Luffenham Village Trust have to be residents of North Luffenham and be ‘competent persons’. There are nine Trustees in all, each of whom serves for a four year (staggered) period. There are five Representative Trustees, three of whom are nominated by the Parish Council (these Trustees do not have to be members of the Parish Council) and two nominated by the Parochial Church Council (PCC). The other four Trustees are called Co-opted Trustees and are elected by the existing Trustees. All Trustees become eligible for re-election at the end of each term of office. A Chairman is elected each year at the Annual Meeting and the Clerk is required to keep full minutes of every meeting.